My favorite clothing item was a jersey, floral skirt from Laura Ashley. I wore it day in, day out. Year in, year out. Until last year. Suddenly little holes appeared in my favorite skirt. As big as my fingertips. So with a heavy heart, I threw it out. 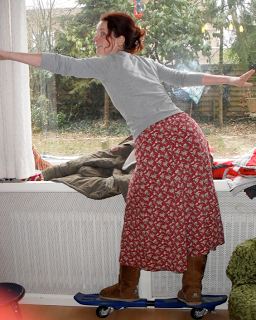 Me and my skirt in happier times! Now my favorite clothing item is anóther floral, jersey skirt by Laura Ashley. But I still miss this one sometimes. Like you I think favorite means comfortable. My comfortable is burgundy velour track pants. I have a similar favorite skirt. It's from The Gap and it's a foldover maxi skirt that I bought while I was pregnant, but I can still wear it. It has to be the most comfortable skirt I own. I've been considering lately making my own clothes because I am just not liking anything out there right now and I need clothes. I have a favorite sweater. It is a plan, hoodie but after all the years it has gotten a few holes, so I fixed them now its like new. Great post. Well, what I wear most often (day in, day out) would be a comfy pair of jeans, but in addition to that, I have a big, baggy, fleecy shirt that I wear on cold, lazy days in winter. Love it and I'll be sad when I have to toss it! Thanks for sharing at My Flagstaff Home! Looking good on the skateboard! (is it a skateboard?) Fun post! Thanks for sharing at Friday Frivolity! Thanks for sharing at the (mis)Adventures Mondays Blog Hop. I look forward to seeing what you share this week!